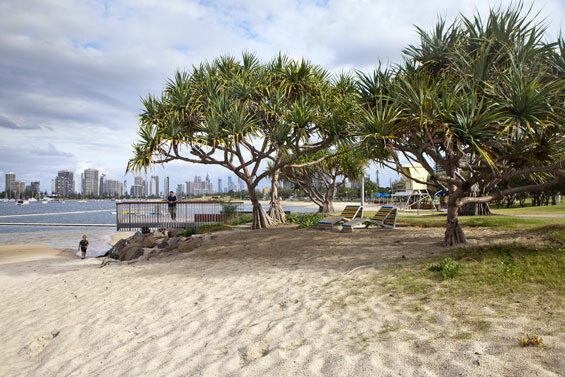 The Southport Broadwater Parklands, with its spectacular Nerang River frontage and proximity to the Southport CBD, has long been a popular community gathering place on the Gold Coast. 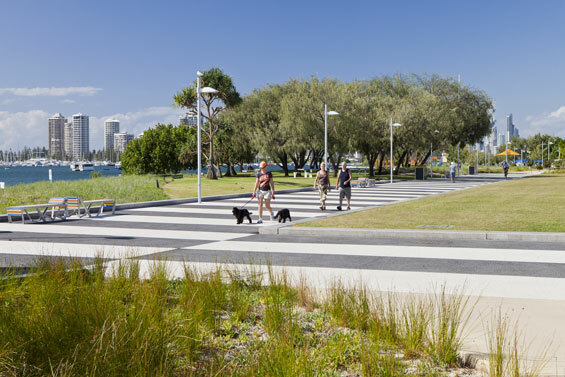 Realizing the potential for the parklands, the Gold Coast City Council applied for funding through the Q150 Legacy Infrastructure Program. 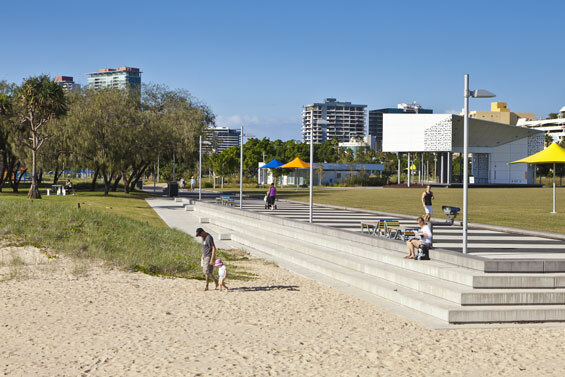 Following the allocation of funding, which was matched by Council, AECOM was commissioned to develop the masterplan for the parklands and see the project through to the delivery of the first stage of construction. 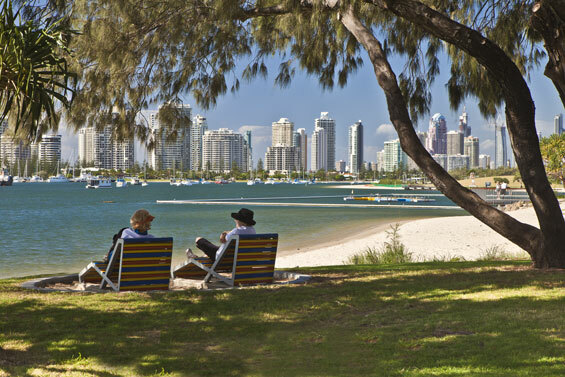 From the outset, the aspirational vision for the parklands was to become one of Australia’s great foreshore parks—an iconic gateway for the Gold Coast and a popular destination where events, history and water combine to create an active, green waterfront. 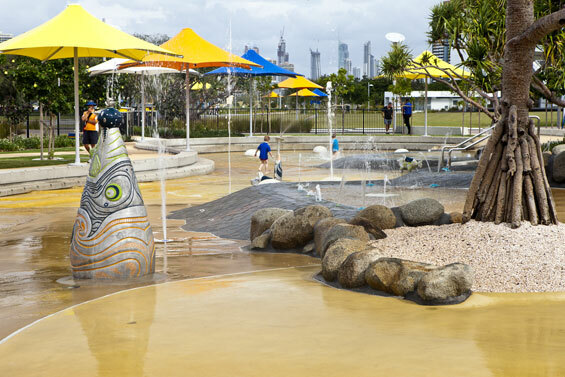 Completed in August 2009, stage 1 of the park includes a major event lawns, bathing boxes, barbeque shelters and play equipment, a central community pavilion, an extensive walking and cycling network, an extended pier, a constructed wetland and bioretention basins throughout the parklands. 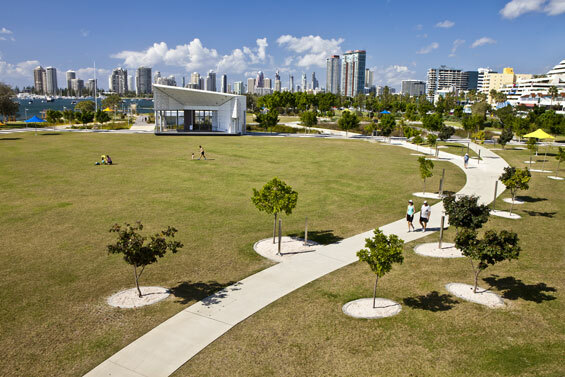 AECOM’s response to the Broadwater’s natural environment reflects a commitment to ecosystem preservation within the parklands that will propel the Gold Coast into the next evolution of sustainable design. 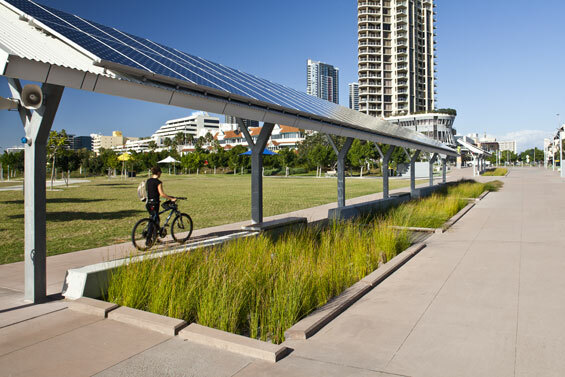 Ecologically sustainable development and water sensitive urban design features have been implemented as bold gestures integrated into the urban design of the parkland. They grab the attention of park users and present the notion of environmental responsibility and preservation as a tangible reality. Planted dunal mounding on the roof top of the pavilion building leads to an elevated viewing point. This initiative provides insulation to the building while challenging the traditional notion of a roof and showing what benefits can be achieved through an integrated design approach. 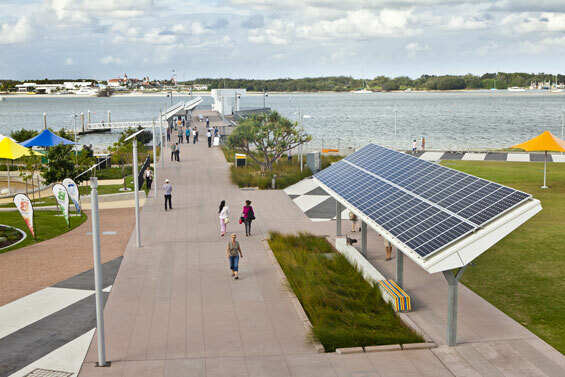 255 photovoltaic panels are integrated into shade shelters to provide a solar spine linking the city to the water. This consolidated display of panels offsets power requirements for stage 1 park lighting in an integrated, architecturally striking manner. 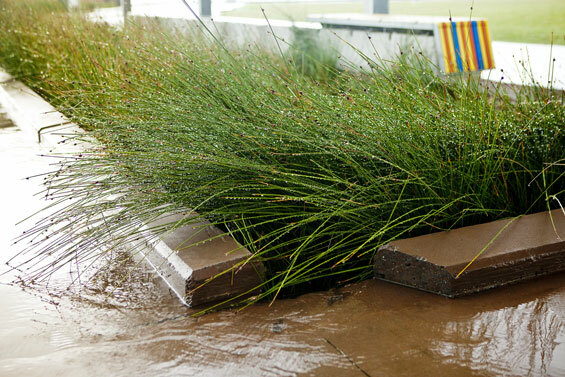 A 5-hectare catchment of previously untreated CBD stormwater runoff is captured and cleansed in a sculptural, terraced urban wetland before discharging to the Broadwater. This feature not only provides environmental benefits but creates a quiet, contemplative ‘breathing space’ between the two large-scale event lawns on either side. The events requirements for the site also required an innovative design response that relied on large-scale, robust spaces that allowed events to ‘bump in’ and ‘plug-in’ with ease. 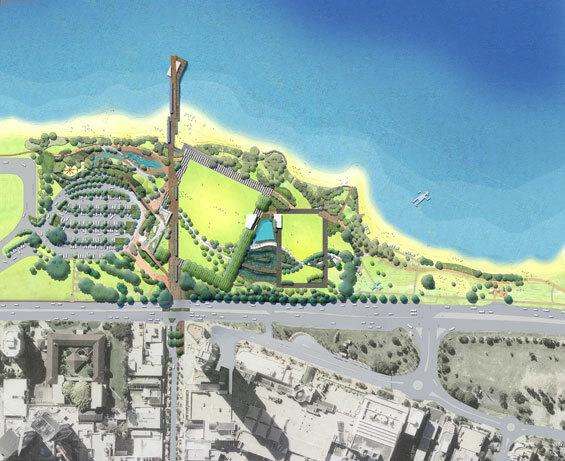 To ensure precise integration, the design team undertook finish-route planning, planned for transition areas and spectator seating and implemented integrated access to points for temporary power, water and sewer—raising the level of quality of facilities for these events to the next level.